The pumpkin craze is real folks! Is it just me, or is pumpkin everywhere this year?! Pumpkin Spice Cookies, Pumpkin Spice Cereal, Pumpkin Spice Peanut Butter, and of course, the iconic Pumpkin Spice Latte. It’s a bit overwhelming – I even have a Pinterest board dedicated solely to Pumpkin. In an effort to keep up with the Pumpkin-wielding Jonses, I’m throwing this Pumpkin Risotto with Goat Cheese & Dried Cranberries into the mix. While some people may have a pumpkin obsession, my obsession generally lies with risotto – Like my Lemon Mascarpone Risotto, Beet Risotto and Grilled Shrimp Risotto. Not only do I like eating risotto, but I thoroughly enjoy the process of making it – Mainly because I get to stand over a hot stove when it’s freezing cold outside. Freezing cold = 60 degrees and below in my book. The process of making risotto is easy, but it does take some babysitting because you need to “feed” the risotto. We’re feeding the risotto with a ladle full of stock time after time, letting it fully absorb between each addition. The process takes about 20 minutes from start to finish, and it’s a full evolution. The risotto starts as hard grains of rice, then it becomes more plump, and then, through all the stirring and the feeding, it takes on the most incredible creamy texture that’s tasty on it’s own, but also totally customizable with any ingredients of your choosing. For this version – We’re going full on Fall. The pumpkin and dried cranberries just call out Thanksgiving to me. Plus, I’m making this risotto totally meat free, meaning that it would be a perfect option to serve for a vegetarian Thanksgiving. The creamy pumpkin lends a rich, earthy flavor to the mix, the goat cheese adds tang and creaminess, and the dried cranberries give zing and add their beautiful color to the dish. What’s your favorite pumpkin dish or product of the season? I’d love to hear in the comments below. 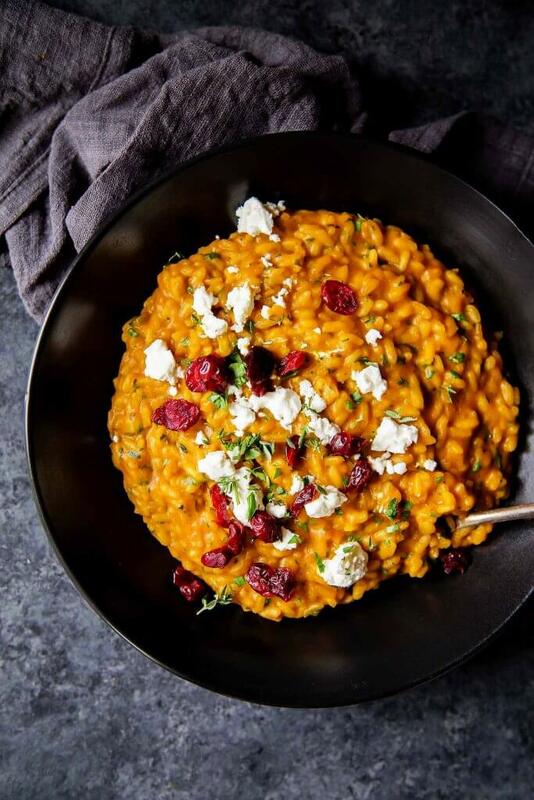 This Pumpkin Risotto with Goat Cheese and Cranberries is a perfect fall comfort food. It’s rich and creamy and perfect for an elegant weeknight meal. Or try serving this to your vegetarian guests at Thanksgiving. If you loved this Pumpkin Risotto recipe I would appreciate it so much if you would give this recipe a star review! Also, be sure to snap a picture of your finished dish and share it with me on Instagram using the hashtag #platingsandpairings and tagging me @platingsandpairings. Barolo has a firm tannins and great body that will cut through the creaminess of this dish. With its buttery notes, Chardonnay pairs nicely with the creamy risotto and pumpkin. Bubbles are always fun – Especially for a special occasion. Try Cava, Prosecco or Champagne. Pumpkin spice everything gets all the glory in the fall, but I love savory pumpkin – like this recipe – too. The combo with the feta and cranberries sounds delicious! Thank you Tiffany!!! I hope you get a chance to try it out soon! There are basically two kinds of people. The pumpkin haters and the pumpkin EVERYTHING people. I love to see you embracing the inevitable of this flavorful season! 😉 And I love the combination of flavors you have here! Canned pumpkin puree is pretty darn bland, but I love how you sweetened it up with the cranberries and add the tang from the goat cheese! Also, this would be an awesome starter course for Thanksgiving!!! Yum! It’s time to start thinking about Thanksgiving 🙂 It’s just about a month away now – Hard to believe! 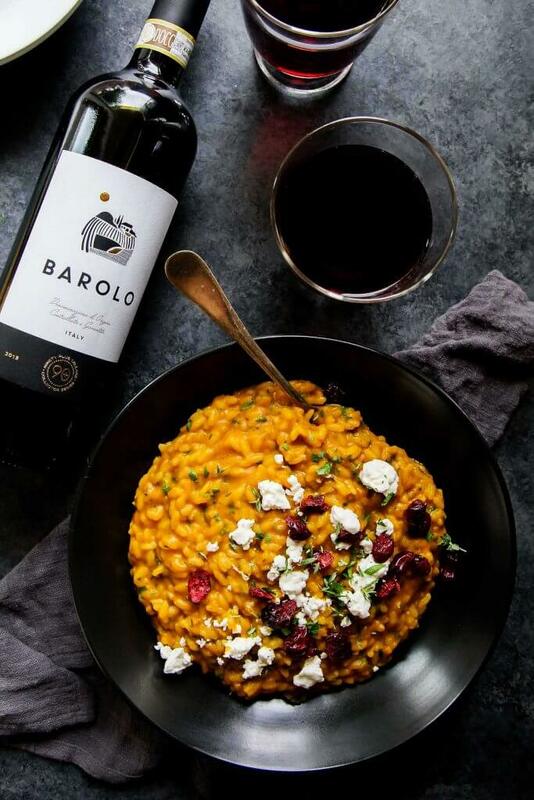 I can’t believe I’ve never made pumpkin risotto – it looks so good and I love the flavors you’ve got going on in here! Perfect for a cool fall night. Thanks Karen – I’d definitely consider this risotto a fall comfort food! 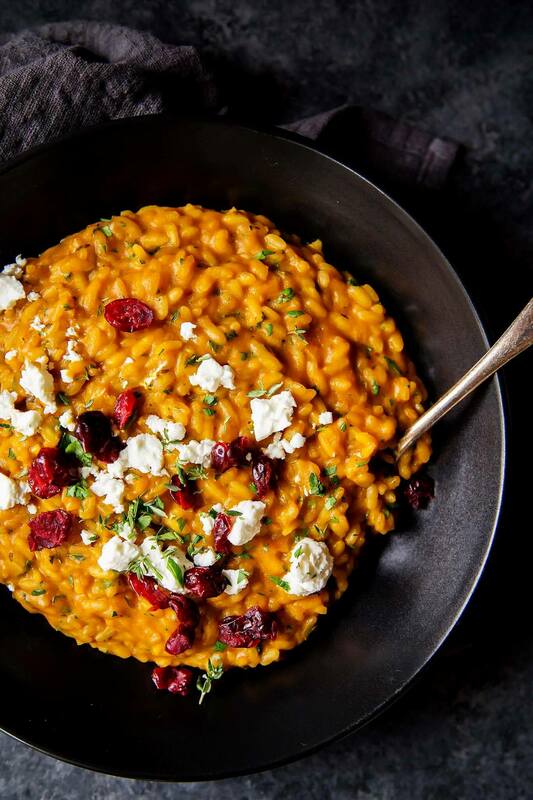 I too have a pumpkin risotto up on my blog and looking at yours, I am absolutely drooling. The color came out so rich and adding those cranberries … so very interesting! Thanks Kankana! Your version looks absolutely drool-worthy as well! I’ve got risotto on the menu in the weeks coming up too — love standing over the warm stove while the weather is crisp outside too! This risotto looks so ideal for Thanksgiving. What a beautiful dish! 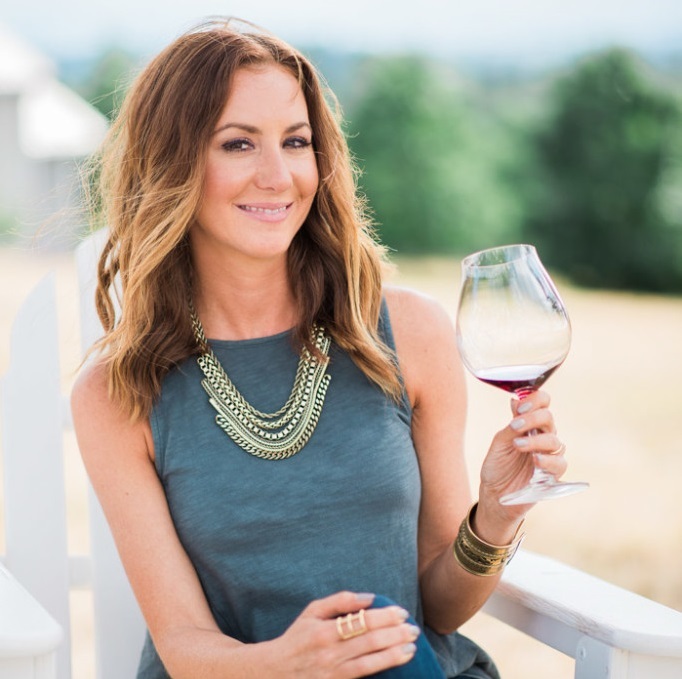 Thank you Marlynn – Cheers! Of course Antonia – I hope you enjoy! This sounds like the perfect side dish for Thanksgiving! Something different, yet festive. Yum! Thanks Monica – I think that it would be fantastic for Thanksgiving! Made this tonight for dinner and it was delicious! I am NOT a pumpkin sweets girl so the fact that this was savory was perfect. So warm and comforting! I’m so glad you liked it Heather – Thanks for commenting! Oh my! This dish looks absolutely fantastic. I’m certainly adding it to my menu for Thanksgiving! Thank you Lisa. This is perfect for Thanksgiving! Enjoy! This was absolutely fabulous, and not difficult to make. Next time, I’m thinking of adding some toasted walnuts to the top. Thanks for a great recipe! Question, I’m making this for thanksgiving, do you think I could make this a few hours prior to dinner? Could you reheat it without it getting overcooked?! Thank you! Hi Jen. This risotto does reheat quite well. You should be just fine making it ahead of time. Happy Thanksgiving! How many ounces of pumpkin were in the can? Hi Angela – There were 29oz. of pumpkin puree in my can, but you will only use one cup. Hope this helps! I made this and paired with pecan-crusted grouper—the flavors were so amazing my fiancé and I have vowed to cook it for our next gathering with friends! The richness of the Parmesan pairs fantastically with the lightness of the feta..and the dried cranberries were such a great component too! I added a pinch of white pepper and about 1/8tsp cayenne. Delicious! Thank you so much for this recipe! You are so welcome Veronica – I’m glad you both loved it! The pecan-crusted grouper sounds absolutely fabulous as well! can you substitute butternut squash? thinking about this for Christmas. Hi Jennifer – I think butternut squash would be delicious in this as well – Go for it! Have you ever made this recipe a couple of days before? I’m looking for recipes to make beforehand to minimise my cooking the day of. How does this risotto do after a day in the fridge? Hi Jana – I definitely prefer this recipe right after it is prepared. Although it is good reheated, it loses its wonderful texture. The best way to reheat it would be in a warm oven. girrrrl! This dish looks crazy amazing! I literally cannot wait to make this asap! And the added cranberries- so smart! Thanks Jessica – It’s the perfect dish to start getting in the mood for fall! And, I need all the help I can get with that! How do you think this would pair with a lemon caper chicken dish? I want to include it but I’m not sure of the flavours. Thanks! Hi Mary – I’m not quite sure that the flavors would go well together… If you’d still like to pair it with risotto, maybe try this Lemon Mascarpone Risotto instead. It’s quite rich, so I might also pair it with this arugula salad. Hope this helps! Could possibly make this the day before and reheat tj3 day of the gathering? Hi Amber – Risotto really is much, much better the day you make it. I wouldn’t recommend reheating this dish unfortunately. Every year, my sister and I swear we’re going to make risotto for Thanksgiving. This recipe is every reason WHY we finally need to make it happen this year! Yay! This is definitely the perfect risotto for Thanksgiving! Made this last night and loved loved loved it. This is a new fall favorite. Thanks so much for sharing. So glad to hear that you liked the Pumpkin Risotto Kristy! It’s perfect for fall! I’ve made this two times, the first attempt wasn’t bad but I’ve been missing that wine flavour from the risotto. The next time I used 1/2 cup of dry white wine like with a classic risotto, left the vinegar out and it was waaaaay better! I also like everything creamy so I just melted the goat’s cheese in, it was heaven. Never thought of pairing pumpkin and risotto before, thanks for the idea! Your version sounds great Anita – I may have to give that a try next time! Really surprised by the amount i got out of this recipe, had doubled the quantities of everything hoping to get approx 10 meals to last us the week…came out with 6 medium size portions, so felt like a bit of stuffing around for not much result! I did make fresh puree though as i would avoid processed food wherever possible. Even after cooking for an hour and adding more vegetable stock, my rice never cooked. Thinking the pumpkin puree was too heavy? Any suggestions? What a bummer Ali! I’ve never had that happen. It sounded like you did everything correct, even adding more stock. Perhaps your heat was not on high enough? You should also be sure that the stock is warm when you’re adding it. My husband and I absolutely love this recipe! We made it last year, and were so excited for it to become fall so we can make it again! We aren’t huge fans of goat cheese, so we subbed feta and it’s phenomenal! I’m so happy to hear that you liked it Christina! It’s definitely perfect for fall! Hello! I’m pregnant and can’t have goat cheese – any ideas for a good substitution?? Thanks! Hi Elaine – You can definitely leave out the goat cheese. It will still be delicious without it! What meat would you serve this with? I need to provide a meat protein at dinners. We don’t eat fish. It would be amazing with this Easy Roasted Chicken or some pork chops! No joke, my husband said this dish was “the food of the gods.” It was really delicious. The only note I would make is that it’s important that your saucepan is medium sized. Mine was really big, so the liquid evaporated too fast. Nothing to do with the recipe, just a note on technique because I’m a risotto newb. Thanks so much, this will become a fall regular! So happy to hear that you guys loved it McKenzie! This is one of my favorite recipes ever – easy enough to make, but impressive enough to serve to anyone! Warm and comforting and savory and rich I honestly don’t have enough good things to say! Thank you so much for sharing! I’m so happy that you love it Anna. Thank you for the kind words! Hi there, thanks for sharing this. I was planning on making this tomorrow for Christmas so I’m not sure if you’ll be able to get back to me so quickly, but I was a bit confused about the stock. Step one says to add stock and the purée, but later on we add warm stock to the pan. The ingredients mentions four cups, so is it 2 cups with the purée in step one then add 2 more cups gradually later? Apologies for my confusion, new to cooking but loving this site. Thank you. Hi Judes – I’m sorry I wasn’t able to respond sooner! I hope you were able to make the recipe. To clarify, you mix together the stock and pumpkin puree. That mixture gets added to your rice. Hope that helps! Delicious! My mother made this for Thanksgiving in a crockpot and I can’t get enough of it. Made this tonight and it was great! I’m so happy to hear you liked it Salina! I’ve made this twice (I love the flavor), but it had a weird bitter aftertaste both times. I used homemade stock, and I thought that was the problem, but I had the aftertaste again tonight using stock that tasted fine. Hi Amy – I always use parmesan that I grate myself… I’m thinking that could possibly be the issue? Delicious! Didn’t change a thing except leaving out the parsley because I don’t like it, and boiling/mashing my own pumpkin because pumpkin puree is not available in my country. That in itself is a miracle, because I always feel the need to change 100 things about a recipe, but this was good as it is! Only complaint is that the portion size is a bit small if you eat this as a full meal. Definitely add some greens on the side! Wow this looks so good and I love the wine pairing idea. The Lemon Mascarpone Risotto also looks DELICIOUS!